Background Dementia is a chronic brain disorder classified by four distinct diseases that impact cognition and mental degeneration. Each subgroup exhibits similar brain deficiencies and mutations. This review will focus on four dementia subgroups: Alzheimer’s disease, vascular dementia, frontotemporal dementia and dementia Lewy body. Aim The aim of this systematic review is to create a concise overview of unique similarities within dementia used to locate and identify new biomarker methods in diagnosing dementia. Methods 123 300 articles published after 2010 were identified from PubMed, JSTOR, WorldCat Online Computer Library and PALNI (Private Academic Library Network of Indiana) using the following search items (in title or abstract): ‘Neurodegenerative Diseases’ OR ‘Biomarkers’ OR ‘Alzheimer’s Disease’ OR ‘Frontal Temporal Lobe Dementia’ OR ‘Vascular Dementia’ OR ‘Dementia Lewy Body’ OR ‘Cerebral Spinal Fluid’ OR ‘Mental Cognitive Impairment’. 47 studies were included in the qualitative synthesis. Results Evidence suggested neuroimaging with amyloid positron emission tomography (PET) scanning and newly found PET tracers to be more effective in diagnosing Alzheimer’s and amnesiac mental cognitive impairment than carbon-11 Pittsburgh compound-B radioisotope tracer. Newly created methods to make PET scans more accurate and practical in clinical settings signify a major shift in diagnosing dementia and neurodegenerative diseases. Conclusion Vast improvements in neuroimaging techniques have led to newly discovered biomarkers and diagnostics. Neuroimaging with amyloid PET scanning surpasses what had been considered the dominant method of neuroimaging and MRI. Newly created methods to make PET scans more accurate and practical in clinical settings signify a major shift in diagnosing dementia pathology. Continued research and studies must be conducted to improve current findings and streamline methods to further subcategorise neurodegenerative disorders and diagnosis. The four types of dementia represent a destructive, prevalent and debilitating mental disorder affecting millions worldwide. To accurately diagnose the disorder, much neurophysiological and lab testing must be conducted. However, difficulties arise when similarities in characteristic readings are inconclusively interpreted to distinguish between the four types of dementia, thus the need for continued identification, through research, of new biomarker testing apart from cerebrospinal fluid (CSF) biomarker testing.1–3 CSF has accounted for the discovery of most known biomarkers specific to dementia. The vast majority of biomarkers are only obtained through lumbar punctures. The results that come from these methods are heavily dependent on the age and physical state of the patient, which makes this method ineffective despite it being the main method for diagnosing dementia. There is common aetiology and significant overlapping of biomarkers between dementia types, which make them harder to diagnose. For instance, overlapping concentrations occur in CSF total tau (T-tau) and tau phosphorylated at threonine 181 (P-tau181P) between Alzheimer’s disease (AD), frontotemporal dementia (FTD), dementia Lewy body (DLB) and vascular dementia (VaD).1 4 Developing less invasive methods used to evaluate dementia biomarkers, specific to a certain type of dementia, is one of the main objectives of recent neurodegenerative research. Employing alternative methods to diagnose different types of dementia will require advancements in neuroimaging techniques such as positron emission tomography (PET) scans and MRIs. There are two types of biomarkers, exposure (risk prediction) and disease (screening and diagnosis), which are generally defined as cellular, biochemical or molecular alterations that are measured in human tissues or fluids.1 4–6 The use of biomarkers is specific to dementia and can be used to diagnose and manage cardiovascular disease, immunological and genetic disorders.5 6 The wide uses for biomarkers and the advancements of such will provide much-needed clarity and understanding of the wide range of neurological diseases. DLB and AD share similar aetiologies, making conclusive diagnosis harder to ascertain, therefore increasing the likelihood for misdiagnosis. Neuropsychosocial profiles observed exhibiting cross-sectional comparisons in mild or early stages of AD requires biomarker measurements specific to each disorder to render more conclusive results. Data were sourced from review journals and clinical studies via PubMed. The following are the supplemental databases sourced on 28 June 2018: PALNI (Private Academic Library Network of Indiana), JSTOR (journals, primary sources and books) and WorldCat Online Computer Library. PubMed and PALNI were sourced on 2 July 2018. The review protocol may be accessed at https://gpsych.bmj.com/pages/authors/. All articles referenced in this systematic review are categorised by publication date, article content and evidence-based research. 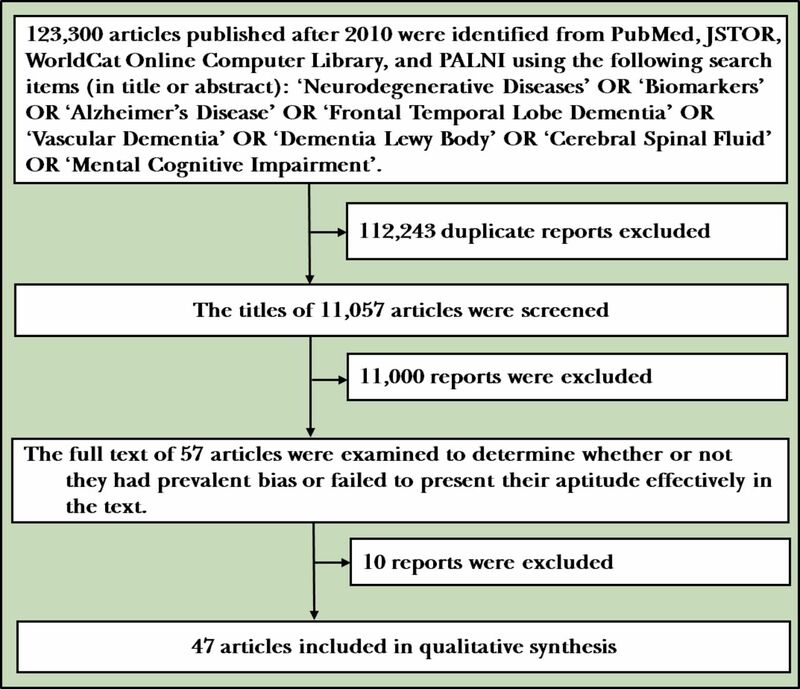 There were 123 300 articles published after 2010 identified from the databases using the following search items (in title or abstract): ‘Neurodegenerative Diseases’ OR ‘Biomarkers’ OR ‘Alzheimer’s Disease’ OR ‘Frontal Temporal Lobe Dementia’ OR ‘Vascular Dementia’ OR ‘Dementia Lewy Body’ OR ‘Cerebral Spinal Fluid’ OR ‘Mental Cognitive Impairment’. In total, 57 studies were researched for this review. Forty-seven studies were used in the analysis. Articles displaying publication bias were eliminated from the review. Articles chosen referenced advancements in genetics, neuroimaging and the localisation of new biomarkers that indicate specific types of dementia. There were other articles dating back to 1992 that were used for background purposes (figure 1). Flowchart of collecting and evaluating research used in this review. PALNI, Private Academic Library Network of Indiana. In this study, 117 participants were analysed. Some were cross-examined in multiple groups when presenting symptoms overlapped. Seventy subjects consisted of 25 cognitively healthy participants; 19 participants with amnesiac mental cognitive impairment (aMCI); 26 participants presented with AD in the template creation cohort group; 47 patients presented with 14 MCI, 27 AD; and 5 patients exhibited non-AD, with one unspecified case of dementia identified in the registration validation chart group.39 The classification was needed to validate method effectuality. The study further negates MRI as the dominant method for scanning initial diagnosis across the broad spectrums of dementia. Although the study is specific to AD, there is potential for future analysis of dementia types and possibly other neurodegenerative diseases in general. The similarities in dementia type using neuroimaging biomarkers make it incredibly difficult to differentiate between FTD, svPPA, nfvPPA and AD since the subcallosal media prefrontal cortex atrophied into the four types.40 Due to the inability of the medial temporal lobe atrophy (MTA) to be evaluated in clinical settings, it is most often neglected as the primary method for diagnosis.41 Volumetric analysis, a method heavily used with MTA, provides an ‘accurate and detailed measure of a predetermined circumscribed area or region of interest’.41 In relation to AD, the hippocampus is the most active part of the brain in this disease and is also the prime location to perform volumetric analysis.41 In conjunction with this method’s impractical use in clinical applications, it also has a few more drawbacks that stem from manual volumetric analysis. The tracer used to delineate the hippocampus’s boundaries, anterior and posterior limits must be trained to do so.41 Segmentation of the hippocampus afterwards would take anywhere from 20 to 30 min depending on the user, which signifies this method’s widely disadvantageous clinical use despite great results.41 Visual assessment tests are adversely viewed due to inaccuracy and lack of precision, but are highly practical for clinical use due to their ability to be performed on several scans simultaneously. More specifically, other studies have shown that the visual assessment of the medial temporal lobes (MTL) rendered similar prediction accuracy in multivariate classification and manual hippocampal volumes.41 Other studies have shown that this method failed to detect any patients carrying mutations of familial AD to be at high risk, or detect progression over time, which hinders this discovery’s applicability in clinical applications. Through recent cross-sectional PET studies, APOE ε4 was found to have abnormally low measurements of the cerebral metabolic rate for glucose (CMRgl) located in the same regions found in patients with AD.36 40 In a study aimed to characterise longitudinal CMRgl declines in normal ε4 heterozygotes, the potential to check the efficacy of current treatment methods and potential candidate therapies for AD prevention were estimated. Researchers considered how this paradigm could efficiently be used to test the potential of AD preventative therapies.36 Researchers identified several limitations in using PET measurements and other biological markers in normal APOE ε4 carriers to test the potential of preventive candidate treatments for cognitive AD-related impairment. Moreover, preventative studies in ε4 carriers may not be generalised to ε4 non-carriers between positive and negative findings.36 There is also the issue of PET CMRgl attenuation in CMRgl decline. This attenuation occurs before clinical symptoms appear and is associated with a decreased risk of AD symptoms.36 However, APOE genotypes and PET measurements have not proven through clinical analysis a patient’s probability of developing AD symptoms.36 Due to limited research, preventative therapies do not accurately predict or outweigh the psychological or social risk that would come from possibly misdiagnosing a patient.36 Despite these hindrances, the study produced a paradigm for characterising the potential of preventative AD treatments without evaluating countless studies and clinical trials. The APOE ɛ4 heterozygotes measured had significant CMRgl declines in the vicinity of temporal, posterior cingulate, prefrontal cortex, basal forebrain, parahippocampal gyrus and thalamus which proved to be greater in the ε4 non-carriers.36 The two main groups of participants consisted of 10 ɛ4 heterozygotes which included 7 women and 3 men. All presenting with the ɛ3/ɛ4 genotype were 55.9±3.4 years of age (mean±SD) and had 15.4±2.9 years of education.36 The ɛ4 non-carriers included 10 women and 5 men. Ten with the ɛ3/ɛ3 genotype and five with the ɛ2/ɛ3 genotype were 57.1±4.4 years of age and had 16.1±1.9 years of education.36 In an attempt to test a candidate’s preventative treatment potential for developing AD symptoms, researchers estimated the results of 50–115 cognitively healthy ε4 heterozygotes between 50 and 63 years of age per active group. The placebo treatment group needed to detect a 25% attenuation in CMRgl decline in the temporal cortex, posterior cingulate cortex, basal forebrain, parahippocampal/lingual gyri and thalamus at 80% power over 2 years.36 If there was a linear digression of CMRg1, then the same number of cognitively normal ɛ4 heterozygotes per active and placebo treatment group would be necessary to detect a 50% attenuation in CMRgl declines with 80% power.36 It was also estimated that 207–289 cognitively healthy ε4 non-carriers from ages 50 to 63 per active and placebo treatment group were needed to detect a 25% attenuation in age-related CMRgl declines in the anterior cingulate cortex, parietal cortex, posterior cingulate cortex and the caudate nucleus at 80% power.36 From these estimations, as well as in previous findings from other studies, regional CMRg1 in ε4 heterozygotes continued to decline in the temporal lobes, posterior cingulate, prefrontal, basal forebrain, parahippocampal/lingual gyri and thalamus during the 2-year interval between baseline and follow-up scans. Limitations were discovered before and during the course of this research. Available articles and methods accessed from research databases were limited to the availability of studies on the topic meeting inclusion criteria. However, there was one factor of influence that could not be controlled by man, but can place restrictions on methodology. Lastly, the aptitude of the researchers writing these varying articles was not cited effectively in their written works, which raised concern regarding authenticity and credibility. The initial study evaluated the effectiveness of 18Fflorbetapir (2,3), 18F-florbetaben (4,5), 18F-flutemetamol and [18F]AFV145. It indicated great potential for what could be accomplished when compared with its predecessor. In the future, I would like to use these newly found PET tracers to retest and re-evaluate the studies conducted that used amyloid PET scanning and documented issues discerning dementia types, thus making the claims and results of those other studies more credible. Regarding limitations for creating this systematic review, there were no particular limitations apart from obtaining access to key articles from selective databases. All of the studies referenced provided significant evidence for new methods and biomarkers. By solely focusing on MHPG levels in CSF and serum monoamines, researchers discovered that CSF and serum MHPG were the most valuable markers to differentiate AD from DLB and PD.4 In relation to discovering the importance of serum MHPG, another study discovered significant associations between APOE ε4 and cognitive performance, temporal lobe atrophy, CSF tau, and phosphorylated tau.37 There were other studies that found different results after conducting research. More specifically, there have been studies that found the visual assessment of the MTL having similar predictive accuracy when compared with multivariate classification and manual hippocampal volumes.41 Other studies, however, have shown this method failed to detect patients carrying mutations of familial AD to be at high risk or detect progression of the disease, which may hinder this discovery’s applicability in clinical applications.
. Biomarkers in neurodegenerative disorders: translating research into clinical practice. Frontiers in Aging Neuroscience 2014;6.
. Cerebrospinal fluid and serum MHPG improve Alzheimer’s disease versus dementia with Lewy bodies differential diagnosis. Alzheimer’s & Dementia: Diagnosis, Assessment & Disease Monitoring 2018;10:172–81.
. Routine lumbar puncture for the early diagnosis of Alzheimer’s disease. Is it safe? Frontiers in Aging Neuroscience 2014;6.
, ed. Vascular dementia: risk factors, diagnosis, and treatment. Hauppauge, NY: Nova Science, 2011.
, eds. Neurobiology of mental illness. 2nd ed. Oxford New York: Oxford University Press, 2004.
. MTA index: a simple 2D-method for assessing atrophy of the medial temporal lobe using clinically available neuroimaging. Frontiers in Aging Neuroscience 2014;6. Joshua Marvin Anthony Maclin, an undergraduate neuroscience major attending Earlham College in Richmond, IN, worked in the Geriatric Psychiatry department of the Shanghai Mental Health Center in 2018 as a visiting student. He also volunteers, as a Bonner Scholar, at Richmond State Hospital and Reid Health Hospital as a lab volunteer. In conjunction with Bonner, he has recently been accepted into the McNair Scholar program where he will continue to conduct research of neurodegenerative diseases, while also pursuing his future aspirations of attending medical school at the Vagelos College of Physicians and Surgeons at Columbia University. Contributors JMAM was the sole writer. TW and SX reviewed and revised the paper. Funding This study was funded by the Municipal Human Resources Development Program for Outstanding Leaders in Medical Discipline in Shanghai (2017BR054), Shanghai Jiao Tong University School of Medicine Collaborative Innovation Project (TM201728), Shanghai Municipal Education Commission-Gaofeng Clinical Medicine Grant Support (20172029) and also the National Natural Science Foundation of China (81571298).